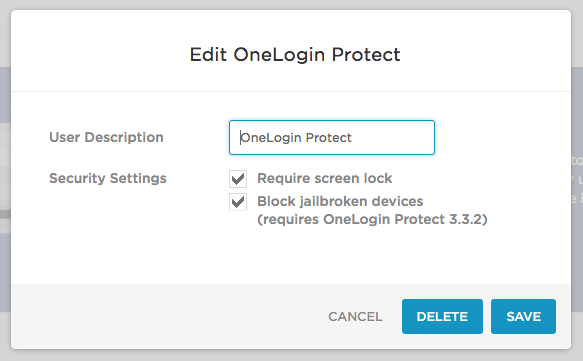 OneLogin Protect (formerly OTP) 3.3.2 provides administrators with the option to prevent users from using OneLogin Protect on a jailbroken device. We have also enhanced security by preventing clones of the OTP seed from one device to another. Your phone appears to be jailbroken. OneLogin Protect has been configured to deny support for jailbroken phones. Contact your administrator for help. Find the OneLogin OTP or OneLogin Protect app in your app list. For more information about OneLogin Protect, see OneLogin Protect for iOS.